A member of the Syrian Democratic Forces (SDF), a US backed Kurdish-Arab alliance, holds a position in Raqa on September 4, 2017. The SDF is battling jihadists in Raqa and Syria's Deir Ezzor province. BEIRUT - A US-backed militia has seized Syria's biggest pre-war gas treatment facility from the Islamic State group in the eastern province of Deir Ezzor, a spokesman and monitor said Saturday. 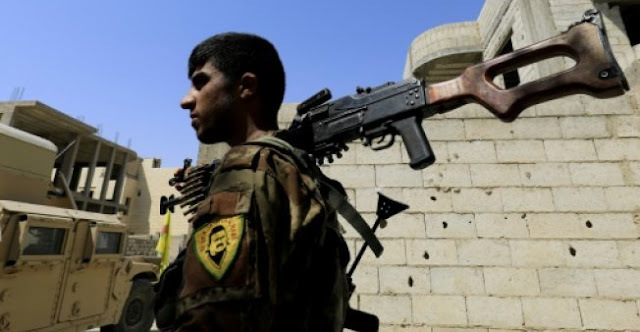 "The Syrian Democratic Forces and the Deir Ezzor Military Council were able to take control of the Conoco plant in northern Deir Ezzor province after two days of clashes," SDF spokesman Talal Sello said in a statement. The advance in the resource-rich province was confirmed by the Syrian Observatory for Human Rights, a Britain-based monitor, which added that the militia had also captured the adjacent gas field. The SDF did not confirm that the gas field had been captured, saying only that its forces were "combing the plant and surrounding points." The facility known as the Conoco plant had the largest capacity of any in Syria before the conflict erupted in 2011: 13 million cubic metres of natural gas per day, according to The Syria Report, an economic digest. It was constructed by a partnership of ConocoPhilips and Total, and came up to full capacity in 2002. In 2005, it was handed over to the state-run Syrian Gas Company when Conoco withdrew from the country. The plant and adjacent gas field were first captured by rebels in late 2012, a year into the uprising that began with anti-government protests in March 2011. In 2014, the Islamic State group captured the facility and gas field as it rampaged across parts of Syria and Iraq, seizing large stretches of territory that it eventually declared its "caliphate". The US-backed SDF and its Deir Ezzor Military Council are battling IS on the eastern bank of the Euphrates river that slices diagonally across Deir Ezzor province. Syria's army, backed by Russian firepower, is carrying out a separate operation largely on the western bank of the river, including in the provincial capital Deir Ezzor city. Deir Ezzor province, on Syria's eastern border with Iraq, is rich with oil and gas fields that served as a key revenue stream for IS at the peak of its power. Syria's Kurds have captured key oil fields in the country in recent years, including in Rmeilan in Hasakeh, where they are refining crude. A US-backed militia has seized Syria's biggest pre-war gas treatment facility from the Islamic State group in the eastern province of Deir Ezzor, a spokesman and monitor said Saturday.